Computational work and software development are a very important part of Synthetic Biology. The iGEM competition again has a track for teams that want to focus on exactly that. This year, we want to create a yet closer link to the wet lab side of iGEM. We therefore encourage software/computational teams to validate their tools and algorithms with some experiments. These experiments can be "outsourced", that is, performed in some other lab or by a collaborating iGEM team. We are working on supporting software teams to find partner labs -- stay tuned! Moreover, if you have a large ambitious project that includes both a lot of computational and a lot of wet lab work, think about registering two teams -- students can be members of both the computational and the wet lab team at the same time. This gives more exposure to the hard computational work which will be judged by experts (and you can win one more price!). Software projects will also be judged by the quality of documentation (both for users and for other developers), by how much they embrace best practices (e.g. modern tools, testing, agile development) and by how well they make use of previous iGEM teams' work and how well they enable other teams to pick up from where they will leave. Many software projects from previous years have resulted in long-term efforts and have even led to several start-up companies. We would love to see that happen again this year. The iGEM software track started in 2008. Since 2012, there is a centralized repository for iGEM software projects on GitHub. Please, use git right from the start of your project -- knowing the history of your commits is very helpful for other developers who want to build on your hard work. This will not only preserve the projects but also help others to avoid re-inventing the wheel. iGEM software developers often work closely with experimental synthetic biologists to improve design, assembly and testing of biological circuits, make bio engineering more predictive or help discovering and exchanging information about standard biological parts. Of course we are open to all kind of cool projects but please make sure that they are relevant to real-world Synthetic Biology. For some things, there is no need to start from scratch. Over the years, the Synthetic Biology community has already created many interesting libraries, design frameworks, and software tools. Please use, abuse and improve them wherever possible. There is also a nascent standard for synthetic biology data exchange (SBOL) which you should probably have a look at. In 2012, the UT Tokyo team created an innovative BioBrick search page. Their project was web accessible and allowed users to search the Registry for parts using many different keywords, approaches, years and other parameters. They also created a rating system for parts based on the number of uses. SYSU-Software created a program called CAST (Computer Aided Synbio Tool), to address specific technical challenges in synthetic biology. 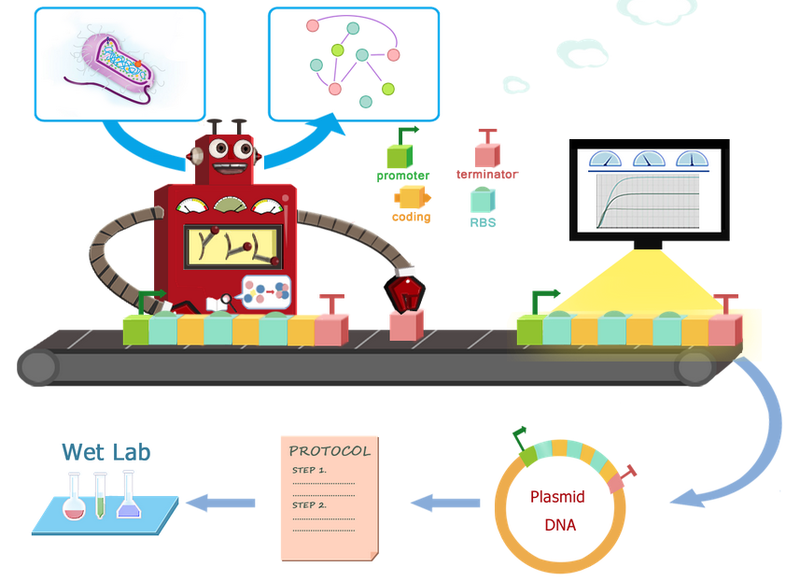 Their software can automatically perform regulatory network and gene circuits design, modeling, vector design and actually build the proposed circuit. All designs can be stored in a database to be shared through CAST. In addition, they incorporated wetlab experimentation into the project to validate their new simulation model. SYSU-Software won the Best Software Project Award in 2013.
for web servers: ensure another developer can easily set up an independent copy of your web server. Preferably provide a Docker container of your web server. A virtual machine snapshot or Vagrant configuration file and / or simple step by step installation instructions may be an alternative. If your institution requires it, seek Institutional Review Board (IRB) approval before conducting software testing. Register the team, have a great summer, and have fun attending the Jamboree in Boston. Present a Poster and Talk at the Regional Jamboree and World Championship Jamboree. Develop and make available, via The iGEM Software Registry, an open source software that supports Synthetic Biology based on Standard Parts. Demonstrate the relevance of your development for Synthetic Biology based on standard Parts. Provide detailed API documentation, preferably, automatically built from source code documentation (use tools like doxygen, yard, rdoc, naturaldocs, etc). Demonstrate that you followed best practises in software development so that other developers can modify, use and reuse your code. Provide more than one realistic test case. Examples of best practices are automated unit testing and documentation of test coverage , bug tracking facilities, documentation of releases and changes between releases. Provide a convincing validation, testing the performance of the development -- experimentally (can be outsourced) or by other teams and users. Note, even if the algorithm or tool turns out not to work that well, the Gold requirement is fulfilled if the test is good and the analysis convincing. Validation may include: preferably experiments, informatics analysis (complexity, run time) of an algorithm, or user studies. Make your software interact / interface with the Registry. Re-use and further develop previous iGEM software projects (or parts thereof) or use and/or improvement of existing synthetic biology tools or frameworks. Support and use the SBOL and / or SBOLv standard. iGEM projects involve important questions beyond the bench, for example relating to (but not limited to) ethics, sustainability, social justice, safety, security, or intellectual property rights. Describe an approach that your team used to address at least one of these questions. Evaluate your approach, including whether it allowed you to answer your question(s), how it influenced the team’s scientific project, and how it might be adapted for others to use (within and beyond iGEM). We encourage thoughtful and creative approaches, and those that draw on past Policy & Practice (formerly Human Practices) activities. We have a great committee to help out 2014 software teams. The Chairs of the iGEM Software track are: Raik Grünberg and co-Chair Gil Alterovitz.